Living legend Toots Thielemans is credited by jazz aficionados and jazz critics as being among the greatest jazz harmonica players of the 20th and 21st century. Harmonica player, guitarist, and whistler Jean-Baptiste "Toots" Thielemans was born April 29, 1922, in Brussels, and has been credited by jazz aficionados and jazz critics as being among the greatest jazz harmonica players of the 20th century. Thielemans learned to play the accordion at the age of three, took up chromatic harmonica at 17, and taught himself to play the guitar in the early 1940s. In 1950, he toured Europe as a guitarist with the Benny Goodman Sextet in and then immigrated to the United States the following year, becoming a member of the George Shearing Quintet. In 1959, Thielemans began working as a freelance, playing and recording with Ella Fitzgerald, Quincy Jones, Bill Evans, Paul Simon, Billy Joel, Astrud Gilberto, and Elis Regina, among others. In 1962 Thielemans recorded Bluesette using unison whistling and guitar, and ever since has been greatly in demand -- particularly for his harmonica and his whistling -- on pop records and as a jazz soloist. Beginning in the 1970s, Thielemans has made annual trips to Brussels and has appeared as a leader of swing and bop quartets. At the Montreux International Jazz Festival, he recorded as a sideman with Oscar Peterson in 1975, then with Dizzy Gillespie in 1980. 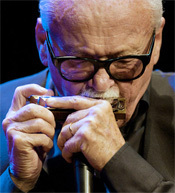 Thielemans's two-volume Brasil Project was popular in the 1990s and found him smoothly interacting on harmonica with top Brazilian musicians. A perennial winner of Down Beat readers and critics poll for "miscellaneous instruments", Thielemans has received many awards and titles including "Chevalier des arts et des letters" in France; Professor Honoris Causa at the two universities of Brussels, Belgium; and in 2001 the Belgian King Albert II honored him with the title "Baron".